When semi-trucks crash into other smaller vehicles the results can be catastrophic. The massive size and weight differential between a passenger vehicle and a truck means truck accidents can and often do cause serious personal injuries. If you have been involved in a trucking accident, contact Allen Stewart. The consultation is free. Federal Motor Carrier Safety Administration (FMCSA) statistics show out of 34,439 fatal motor vehicle crashes in 2016, 4,079 of those involved large trucks or buses. That number has risen over the past two decades, with 2016’s total truck-involved crashes increasing 6% since 2015. The states with the most fatal crashes involving large trucks and buses are California, Texas, Illinois, Indiana, Ohio, Pennsylvania, New York, Florida, Georgia, and North Carolina. Those states represent 51% of fatal crashes involving at least one large truck or bus. 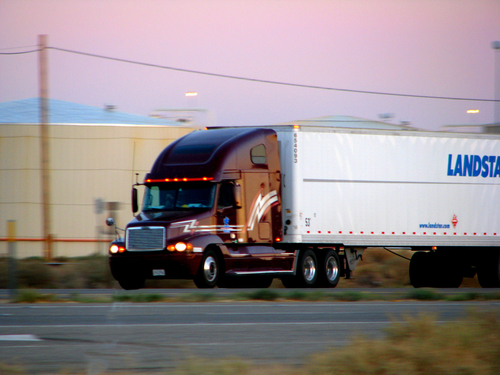 If you are involved in a trucking accident, several parties could be at fault. The truck’s driver, the truck or trailer’s owner, the company that leased the truck or trailer or the truck or trailer’s manufacturer could all potentially be at fault. If a trucking company breaches FMCSA guidelines – hires an inexperienced driver or a driver who fails a drug or alcohol test – they could be liable. The truck company could also be held liable if they incentivize a driver to work more than allowed by law, making the driver fatigued and causing a wreck. The shipper or loader of the goods on the truck could be liable as well for overloading or improperly loading the goods. If you are involved in a truck accident, your first priority should always be your immediate safety. If your vehicle can move, pull over into a safe area away from traffic. If you can, exit your vehicle and get to safety. Once you’ve turned off your car, check on the other involved vehicles and ensure their safety as well. Your next step should be calling 911 to report the accident and any possible injuries. Police reports help document when and where the accident occurred, the parties involved and their statements about what happened. The report can also help your attorney in dealing with insurance or trucking companies if and when conflicts arise. Much like in a crash involving only passenger vehicles, you should document as much information as possible if you are physically able. Take photos of the accident scene, including the license plates of the vehicles involved and insurance information from all involved drivers. If you don’t have a phone or camera, write the information down and put it in a safe place. If you or a loved one is injured or feels any pain after the accident, you should seek medical care immediately. Potentially dangerous internal injuries can first appear as minor aches and pains, and can only be diagnosed by qualified medical personnel. It’s also important you closely follow any instructions given by doctors or physical therapists, including going to any and all appointments. Not only will it help you recover faster, but it will allow you to fully document the extent of your injuries. Your next priority after ensuring your health and safety is contacting your insurance company and beginning the claims process. By giving your insurer complete and accurate information you help them expedite the restorative process. It is imperative you keep track of all relevant documents related to the accident, including police and accident reports, medical statements and any witness reports. If you or a loved one were injured in a truck accident, the personal injury attorneys of Allen Stewart, P.C. can help you recover compensation for your injuries. Don’t wait, contact us today for a free evaluation of the merits of your truck accident injury claim.